·Details of coming DST EVENTS- Days of Renewal and Fatima Challenge, Morgan Chambers immigration!! ·Other events of interest – NSC DAY OF RENEWAL , St Davids Cathedral Fellowship, Celebrate Conference and a lot more. on Saturday 10th December with workshops on topics including "Praying for healing", "How to run a prayer group" by Viven Snow, and a special interest topic on "Spirituality in healthcare" by nursing lecturer Pat Williams. Morgan Chambers who leads the Diocesan Service Team Publicity events has decided to immigrate to the United States to join his Fiancee Irina Zarahi Barahona. DST Team wishes him all the best and the good Lords blessings for the future. Morgan will continue on the DST Team till the team finds a suitable replacement volunteer to take over the publicity work. The DST Team is gratefully thankful to Morgan for all the wonderful work he has done to keep us all in the Archdioceses informed!!! On 31st October 2011, Archbishop George Stack carried out his first initiation ceremony after his installation as a bishop in June 2011. The initiation ceremony took place in the University of Cardiff Catholic Chapliancy. Please keep the newly baptised in your prayers. 10-30am – 3-30pm- ALL ARE INVITED!!! For NSC members, There will be an NSC meeting following this event. The LIFE IN THE SPIRIT SEMINARS , led by Derek Williams and Andrew Stayne, will be held in Our Lady of the Taper, Cardigan, over the weekend 2nd - 4th December 2011. There will be 7 sessions, beginning on Friday evening and ending on Sunday afternoon. Please keep this weekend free so that you will be able to come.. 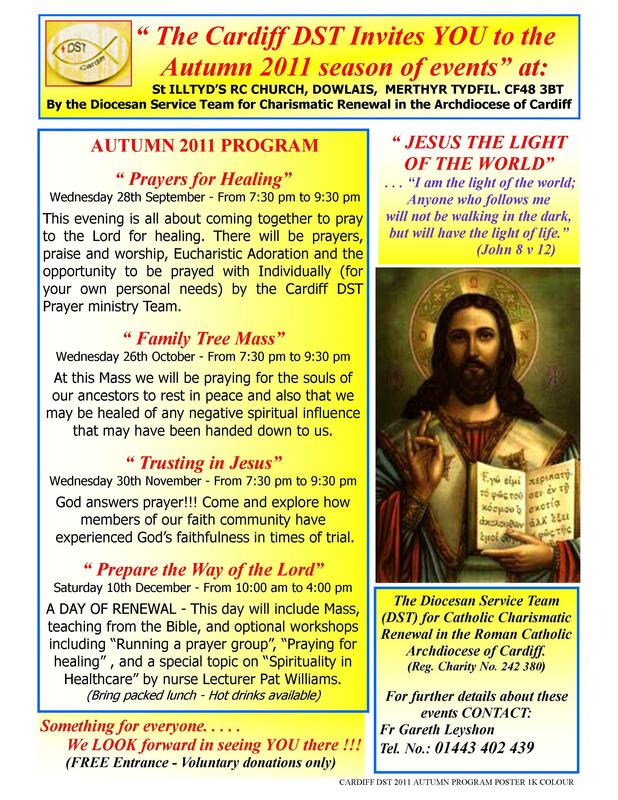 The St Dyfrigs prayer group which ran on every 2nd and 4th Thursday of the month has been discontinued. Shared Meal: 31 Dec New Year Eve shared social meal @ 8pm open to all friends of charismatic renewal in St Dyfrig's Parish Hall. So dont forget to bring in and share a buffet meal. Followed by Tea and coffee social in the presbytery and a display of fireworks!!! Don't Forget to get your own fireworks before the bonfire night stocks run out !! !